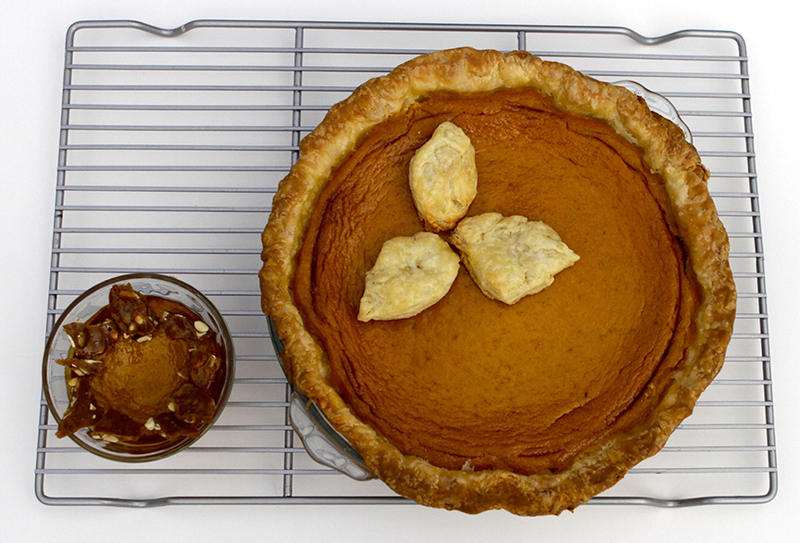 We loved this refreshing variation on pumpkin pie. I topped it with a spicy pepita (shelled pumpkin seed) brittle. The brittle is pretty easy, as far as candy making goes. I adapted a recipe from sophistimom by making it spicier with a lot more cayenne. It really compliments my real pumpkin pie recipe. 1. Butter a large cookie sheet or line it with a silicone mat. Melt butter in a heavy bottomed saucepan set over low heat. Stir in sugar, honey, spices and salt. Stir ingredients together until the sugar starts to dissolve. 2. Raise heat to medium and let the sugar come to a boil. When it reaches 280° on a candy thermometer, stir in pumpkin seeds. Bring the mixture up to 300° (hard crack stage). Remove from heat and stir in baking soda. Pour onto prepared cookie sheet and allow to cool. Need a Gluten Free variation? Bake individual sized pumpkin custards and then top with the brittle. Your gluten free friends will enjoy the crunch and texture of the brittle and how it contrasts with the creamy custard. Ditch the cans this year! 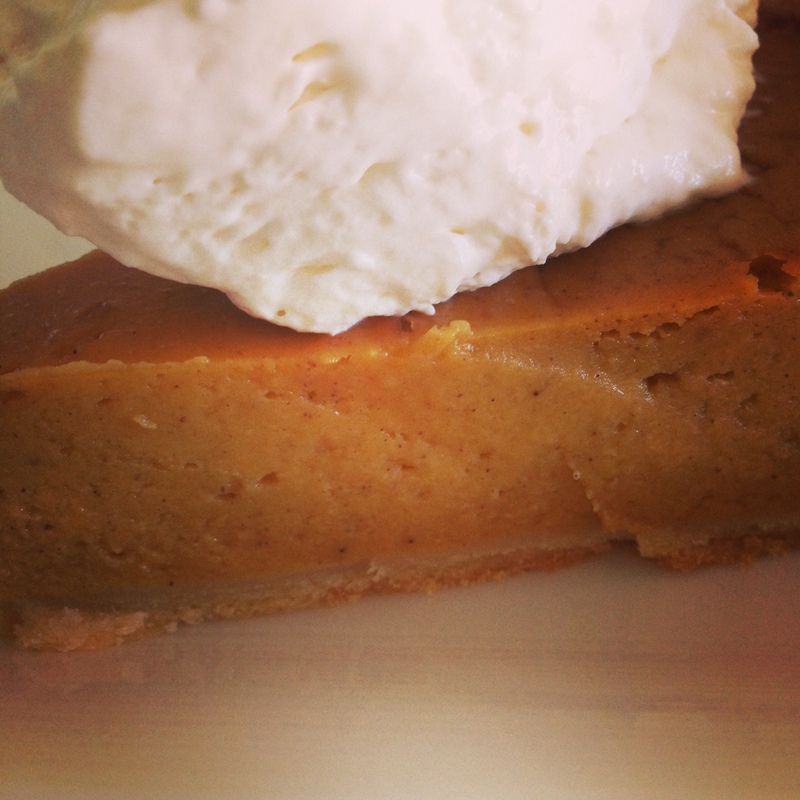 Try this real pumpkin pie made with a sugar pie pumpkin, honey, cream and milk, eggs, fresh ginger, spices and love! I use the word “real” to mean fresh, whole, and unprocessed foods, and without refined sugar. I made this last year for Thanksgiving. It was gone in a few minutes, leaving the store-bought pumpkin pie next to it largely intact. I’ve since made it three or four more times and my family is in love. So, can a pie by a healthy treat? Maybe this one! Pumpkin is low in calories, and high in fiber and disease-fighting vitamins. It is one of the best source of bioavailable carotenoids and is considered by some to be a super food. I always knew I was onto something when I ate pie for breakfast! My dad used to do it, too. 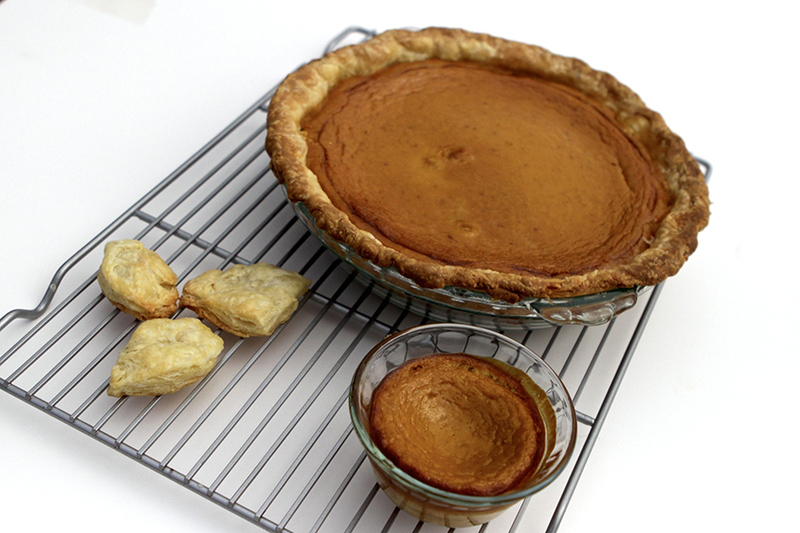 I recently read an article detailing why canned pumpkin makes better pie. I was dubious, which was confirmed when I saw the “news” was sponsored by one of the largest manufacturers of canned pumpkin. Hmmmm…. And I bet anyone who has made pumpkin pie has tried either evaporated or condensed milk. But think about it… Cans are a great way to preserve food for when fresh isn’t available. Do you have access to fresh dairy? I’m guessing yes. I dare you to try this recipe and tell me fresh isn’t more flavorful. Roasting the pumpkin whole and peeling it when cool makes it super easy, as well. I use a blender to make the batter, leaving my mixer free for whipping cream! Adapted from allrecipes.com. Makes one 9″ pie. Preheat oven to 375° F. Place pumpkin directly on a center rack. Roast about one hour until the flesh is soft to the touch with an oven mitt. Turn off the oven and allow the pumpkin to cool completely. Preheat the oven to 400° F. Peel the skin off the pumpkin and separate the flesh from the strings and seeds. Place the flesh in a good blender or food processor and blend until smooth. Next, since pumpkins vary in size, put the puree into a bowl and then measure 2 cups of pumpkin puree and return it to the blender. (No need to wash or rinse the blender in between!) Reserve any extra puree for Pumpkin French Toast Bread Pudding. Add the spices, eggs, honey, milk and cream to the blender and mix until everything is uniform and smooth. Pour into the pie crust shell. Bake for 50 to 55 minutes or until the center is set. Serve warm or room temperature. Use leftover crust to make “cookies” in the shape of leaves. Sprinkle with cinnamon and sugar. Bake them for 10 minutes or until golden. Kids love to help with this! 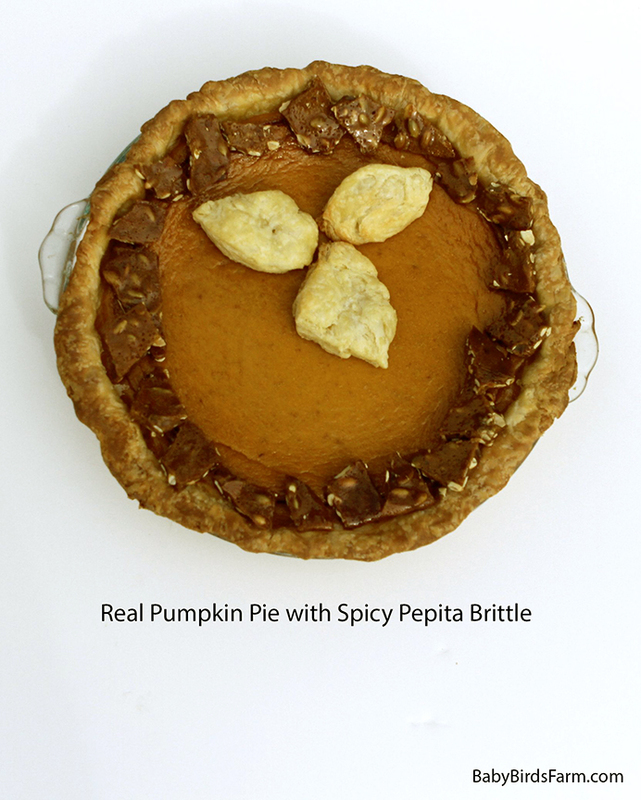 Decorate with a spicy pepita (pumpkin seed) brittle. See the next post for the brittle recipe. 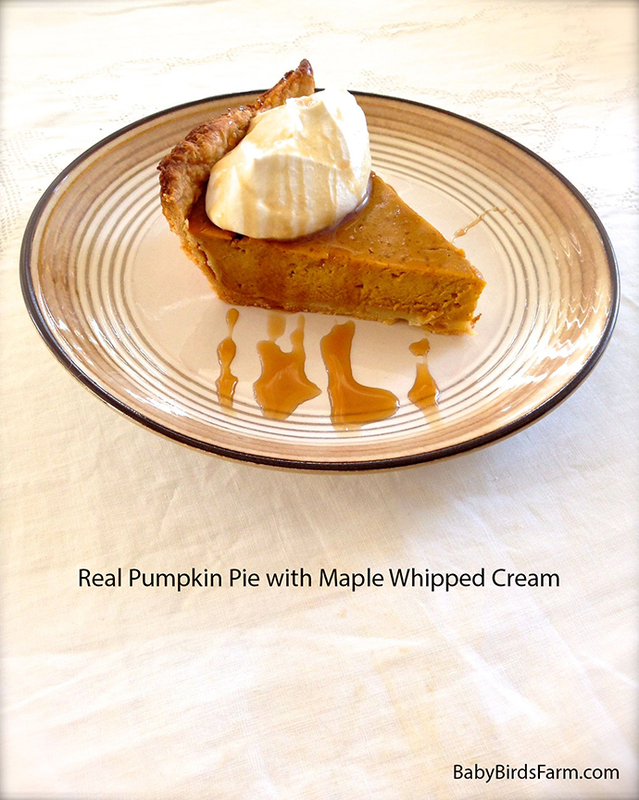 Serve with maple whipped cream, recipe follows. For gluten-free friends, pour some of the pumpkin batter into single serving oven-safe custard bowls or ramekins. Bake about 25 minutes until set. Decorate with spicy pepita brittle for some crunch and texture. In the clean bowl of a mixer, beat the cream and maple syrup on high until soft peaks form. Keep refrigerated.